21 Layers of the Soul: Healing the Karmic Ties with Friends, Lovers, Family and Enemies by Annemiek Douw, MSc is one of the most fascinating metaphysical books I’ve read in quite a while. Douw is a Dutch healer with a busy European practice. As is often the case, her personal physical and emotional traumas led to unusual paths and extraordinary healing abilities. Part One describes her personal journey. Part Two gets into the meat of the material—explaining the 21 Layers of the human auric field. Most of us who grasp the concept of auras have come to envision what she labels as layers 1-4: Physical, Emotional, Mental, and Astral. Beyond that, Douw defines various layers that reveal our complicated relationships through time and space. We are individuals, but we are also part of families, races, soul groups, humanity and many other categories. As the layers progress, they become less individual and more inter-related. The author explains each layer and then illustrates with case studies of clients dealing with personal issues that brought them to her door. As someone who also works in energy healing, I was envious of her ability to read auric fields and pinpoint where a client needed help. The material supposes a world view of past lives and karmic ties. Working with her spiritual guides, Douw hones in on specific past lives to explain current life situations. As I’ve seen in other books on similar subject matter, people often carry erroneous life lessons from one experience to another. For instance, in a very simplistic example, if someone dies by drowning, their last thoughts may be “never go swimming.” This leads to an “irrational” fear of swimming in the next life. As a healer, Douw goes in and works in the proper energy field to release that past life fear and rewrite their life script. The case histories reveal much more complicated issues. If there is truth to the concepts of this book, we all are influenced by thoughts and experiences far beyond our conscious awareness. This book is an important addition to the lexicon of metaphysical books on spiritual healing. In this day of expanding consciousness, our understanding of the human experience continues to grow. 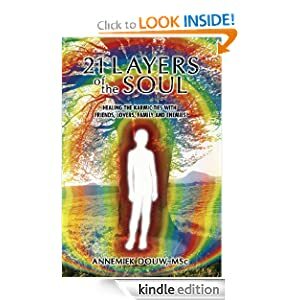 If you’re ready to widen your world view, read Annemiek Douw’s 21 Layers of the Soul. When we experience synchronicity, the events are always highly personal and always relevant within our own private context…..so as a result, the synchronicity I experienced with this post is maybe hard for anyone to appreciate except for me…as the events unfolded earlier today. Reading this post, though, served as a signal to me that has been about two months in the making that has to do with a kind of work I knew existed through my own direct experience, which began decades ago when I saw how I had the ability to shift patterns of energy/consciousness in people much as you shift a vibration like striking a tuning fork to induce a given vibration, and if receptive, the person leaves the old vibration and adopts the new one. This form of energetic medicine led me to be able, for example, to induce the vibration for awakening the energetic sensing ability that we all have, which is known as seeing auras, for example. But along with this awareness that I had this gift, came the realization or feeling that I had to do the work of clearing my own field of the glitchy energy I possessed before doing this work with others. I have often wondered if I would ever even get there. My inner guidance was always quite clear when it would say, “No, you aren’t ready yet.” I would wonder when that time would be, in this life, if at all. It was this nagging kind of mystery of sorts, but I always paid heed to it. The last ten years (ten years almost to the day in fact) I have had an awakening process that has been a very thorough and deep clearing of a host of glitches, many small and nearly inconsequential, while others have been more significant and troublesome. Nearing what I had observed was the clearing out of these energetic patterns, I began having things come to me unbidden and highly synchronistic taking place that began to communicate to me that it was time to begin this next phase in my work….after all this time. The first event took place in November of this past year. So the last two synchronicities happened in rapid fire sequence this morning, first with an interior vision/communication from what always sounds like another presence, but is in fact coming from my higher self. Immediately after that, I saw your blog come up on my admin page, I clicked on it, scrolled down and clicked on this post. It described precisely the type of way of working that I have known I had, but have not yet used to any significant degree all these years. I know that these kinds of things are themselves so private or crafted specifically for the person for whom they are intended and as a result their relevance is often lost on others. But I wanted to thank you for putting this out there because it was the right thing at exactly the right time for me to read. As an aside, the key to reading auras is that your body has the ability, not your mind. Imagine feeling your own energy…and imagine that this energy is a vibrant field that allows you to pick up an incredible amount of information around you. Somehow, you don’t know how, that energy in you in all its vibrancy picks up information in the energies surrounding you. Your field “brings” back the information where it gets translated into images such as a moving changing field of light surrounding a person. But you feel it in your body. You feel it there because that is where the sensing centers are. Like a big satellite dish, it’s picking up all this data. The secret is in turning of the mind or defocusing from it, which is why when “seeing” most who see them will look slightly beyond the person, engaging peripheral rather than direct focus because you are picking this up not from the eyes, but a more seemingly “peripheral” ability. Maybe this might help you in discovering your own native sensing. I hope so. …And thank you again for doing your part! Reiki via Skype. Does it work?